probably still looks mostly the same. Please share to anyone that might be interested. Excellent super reliable rally car. Needs work to get it running. I've been out of country, and havent' seen the car in several years. So I'm writing this from memory... all this info is as accurate as I can remember. When I moved away I was in progress of upgrading the Paseo into the best version of itself. Best (non-turbo) motor, best gearbox, best suspension. The only upgrade I never got around to was the rear discs. Need to source those parts from a Starlet GT somewhere. Car is in the middle of a JDM 5E-FHE motor swap. Higher compression and stronger internals than stock motor. Motor is mounted, but most things are not hooked up. Stock wiring harness is almost completely uncut. So can easily revert to stock ECU and Ignition if needed. Set of very well used HotBits street-spec suspension, probably needs a rebuild. Only good for tarmac. almost all rims will have gravel or snow tires mounted. But they will all be hard like hockey pucks by now. You will never find a car that is cheaper or easier to maintain than this. It is so reliable and easy to work on. I could run an entire season of stage rally without a service crew, everything on the car is so simple and reliable. Nothing ever broke, unless I hit something. Very easy to drive, very easy to maintain. Perfect for any beginner or budget rally team. It will definitely need some work and TLC to get it stage ready again. Body and most parts should be pretty much rust free. Most of the rust is probably underside of the floorpan. I'll do a brain dump about everything I remember about this car, and everything I know about Paseo's in general. And I'm always willing to answer questions if the buyer needs help putting it all back together. Car is up on stands, and not currently rolling. So moving it could be a challenge. Please find the notice for the upcoming Maple Leaf Rally Club's Annual General Meeting on February 26th, 2019. 3. To transact such further business, or any other business, as may properly come before the meeting or any adjournment or adjournments thereof. 4. To Elect Officers and Directors for 2 Year term starting immediately following the AGM, President, Secretary, Treasurer. If you cannot attend in person, you may appoint another member-in-good-standing of 2018 to act for you by proxy. To be valid, proxies must be deposited with the Club Secretary [secretary@mlrc.ca] before 5:00 p.m. on Tuesday, 26th of February 2019. This may be done via a paper copy, electronically or e-mail. NOTE: We currently have people will to stand for the roles of President and Treasurer, but no one has identified an interest in the role of Secretary. If anyone is interested in this or any of the other roles please let us know. I’m happy to share, that we have a new, VERY GOOD venue, where we can test rally cars. The venue is located off Highway 401, 3 hours from Toronto, just under 3 hours from Montreal and 1 hour 45 mins from Otta wa. The venue is a LARGE quarry, with roads in it. The total length of the stage, that we can run through the quarry is 4.5 – 5.5 kms. This is NOT Millhaven Quarry, which we regularly use for public Race Lab events, this is another, much larger venue, that we’ve used in the last 2 years for the military training, and now we are ready to offer rally car testing there. When testing on roads, co-driver is essential to be able to push, because roads are hard to memorize. In this venue 70-80% of the corners are visible or easy to remember, therefore it is possible to push without having your race co-driver present. The surface is not very hard packed, which makes this a great place to test and setup for rallies like Tall Pines, with soft surfaces. Soft gravel tires are recommended (unless it will snow last minute), and tire wear will not be high. The surface is smooth enough for us to run street cars there during military events, so it’s definitely not rough for rally cars. We are running a test day there on Sunday November 11th, with free access for recce on Saturday November 10th. If you wish to come for Sunday only, recce opportunity will be available on Sunday also. 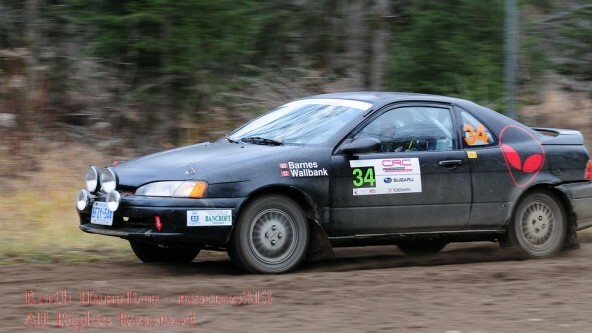 Private coaching (if you wish to get any) prices with me, in a rally car: $200 + tax per hour. 7 General / Rally / Re: Why low entries at Pines? I've also been on a hiatus due to financial reasons. Having said that, the Insurance/Safety and Etest are all issues for me. The Etest looks as though it may be no more as of April next year thanks to the PC's. Insurance I can deal with through a company in Quebec. Safety I'm hoping to get sorted soon. Financially, I made the mistake of moving into a more powerful open class car due to the hunger of wanting to try and be competitive with the top guys. If I was to do it again, I'd go a less expensive route, pump gas, lower power etc, 2WD maybe. It would be really fun to see a bunch of fast drivers in cheap 2WD cars. Kind of like the Suzuki that Pete ran a few years back, where it comes down to the skill of the driver and less about the car. There's varying reasons for the decline, one reason is the availability and accessibility of rally cars. If you want a new one you're looking at potentially over 50k easy for a somewhat competitive Subaru. With older cars being retired for various reasons it seems to just be out of reach financially for the common guy who loves motorsport. This topic could be debated for years, due to so many reasons, but when it comes down to it money is the driving factor for probably 99 percent of people. The sport ain't getting any cheaper, and the divide between the rich and poor in this country is only getting bigger. 8 General / Rally / Anyone from Mississauga going to the Pines? I would like to buy a set of rims/tires in Mississauga but never get to that area (I'm in Ottawa). I'm asking if someone in Miss could buy them for me and bring to the Pines. I would pay up front; cost of wheels/tires plus your fee (I was thinking $50 but am negotiable). The package is near 401 & 403 and are only available M-F between 8:30 and 4:30. This will be my 14th straight Pines and I am well known in this community. Thanks in advance. Now up on eBay. Can deliver to the GTA. 10 General / Rally / Re: Why low entries at Pines? Safety/insurance will make that a permanent retirement though if it's still the same situation or worse then when I ran.